Do you service outside of Detroit? Absolutely! We pride ourselves on the large area that we're able to service. We think it's important to give your clients as much choice as possible, and this translates into the expansive area we're able to proivde transportation to. We provide service all over Michigan! This includes all of Wayne, Washtenaw, Oakland, Macomb, Monroe, Jackson, Lenawee Counties and more! Our Service Area page has more info! Yes! As long as you of legal drinking age, that is! They are party buses after all! All of our amazing party buses have bar areas with luxurious granite counter tops and coolers that are prefect for chilling, mixing, and serving up your favorite drinks! Do you provide alcohol on the buses? No. As stated above you are permitted to drink on the buses, but you must bring your own beverages. Party Bus Det is not permitted to supply any alcohol. We do, however, supply ice, glassware, and paper towels! Unfortunately no, we do not allow any smoking of any kind on any of our buses or limos. However, all party bus rentals with Party Bus Det include unlimited stops, so you can pull over as many times as you need to at no extra charge! When you need a smoke break, just let your driver know! All the time! Party Bus Det operates 24-7 all year round! No matter when you need a luxury party bus, we're here for you! Give us a call any time day or night for more information or to book your reservation! Party Bus Det has the best overtime policy. Some other companies will charge you for the full hour even if you're event is only a 15 minutes over the scheduled time, or they rack up the hourly rate for overtime! Party Bus Det will absolutely never do this to you! Party Bus Det keeps overtime rates at the same rate as your regular rental price and we charge in 15 minute increments! Did your event go over by 30 minutes? Then you only pay for 30 minutes! What types of features are in your party buses? 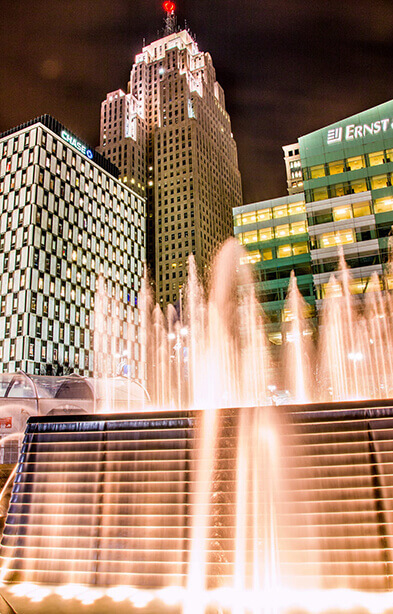 We have all of the best features for your party bus trip in Detroit! We offer amazing multicolored lighting, bar areas with beverage accessories as well as coolers, hardwood flooring for dancing, tinted windows, flat screen televisions, subwoofer equipped sound systems, and more. Do your buses have restrooms? Unfortunately, none of our vehicles come with restrooms included. This is because we find that this adds a not-so-pleasant smell to the interior, and that's no fun for anyone standing by the bathroom. We will stop anytime you want for a bathroom break. We service many different types of events! Some of the most popular include weddings, corporate events, school dances, birthday parties, bachelor and bachelorette parties, fundraisers, sporting events, concerts, prom, homecoming, and more! Yes, of course! Your bus will have an amazing stero system that comes equipped with a subwoofer as well as iPod and MP3 capabilities...you can plug in your phone and play your personalized playlist in seconds...that's what it's all about! Should I rent a party bus or a limousine? A short answer is...yes! With a party bus, you will have room to stand, as well as a dancing pole. In a limousine, you aren't going to be able to stand up, but you'll have that elegant look that weddings and corporate events call for.